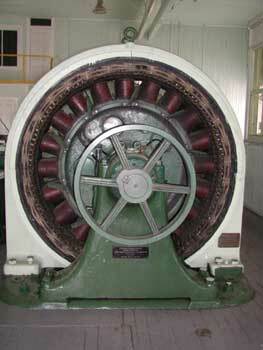 Each of these twenty coils then has a magnetic field, or 'flux', around it, and as each flies past the fixed wires of the stator, electricity is induced. Homes and businesses near here immediately use this power for lights, televisions, computers, stoves, anything that uses electricity. Up until the late 1960s, this control room was staffed throughout the day, and with an operator on-call throughout the night. 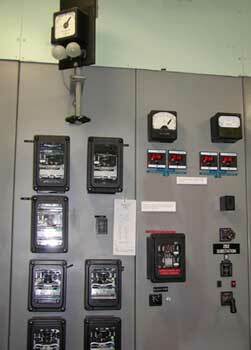 These meters and relays monitor the operation of the generators and the electrical power produced, insuring compatibility with the rest of the power grid. The information from the instruments is being monitored at the Cabin Creek hydro plant nearly five miles south of this plant. This interesting demonstration shows how electricity under high voltage (12,000 volts) can arc from one conductor to another. The spark 'jumps' at the narrowest point between the copper wires. Then as the spark heats the air to a thousand degrees, the hot air then rises, moving the spark up the wires. 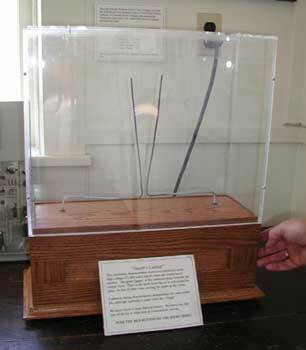 Lightning during thunderstorms demonstrates the same principle, although lightning is many times the voltage! This washer was manufactured by the Nineteen Hundred Washer Company. However, it has patent dates as late as October 1919, and hence was probably made in 1920 or even later. Washing clothes by hand was by 1920 a disappearing chore if electrical power was available to the house. 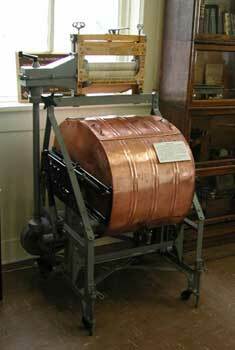 This brass-tub washer was powered by an early electric motor that still runs today. Electrical sockets, plugs, and the voltage supplied have not changed much in 80 years. The motor (with a patent date of 1905) was belted to an agitator, rocking the tub which was filled by hand with warm soapy water, removing a week's worth of dirt. Located in a fully functioning and operational Hydroelectric generating plant in Georgetown, Colorado. The plant is owned and operated by Xcel Energy. It has been in operation since1900.